Archive for the ‘Features’ Category. If you charge your clients by the hour, it’s obvious that you need to know how long you’re spending on projects. But even if you don’t, and you currently think you don’t need to track time, you should think twice! Keeping track of time spent is not only useful for billing, but can also contribute to a culture of open communication within your team. If a member’s time spent is visible to her peers, it’s a strong incentive to make rational decisions about how to use everyone’s time. Therefore time trackers are one of the most important tools for any leader. After logging in and going to the dashboard of the project you worked on, hit the “Timetracker” bar. It is with great pleasure that we announce the availability of the Collabtive Mobile Web App. It enables you to use Collabtive on mobile devices like tablets and smart phones. The mobile web app comes as a plugin for Collabtive. Once installed on your web server, it allows Collabtive to serve mobile devices with a mobile-friendly user interface automatically. This way you don’t have to download or install anything on the individual devices. The mobil web app has been thoroughly tested on iOS (iPhone, iPad) and Android devices. We have often been asked for a roadmap detailing the next development steps of Collabtive. In the future i will therefore publish the roadmap for the next Collabtive release once it has been finalized. 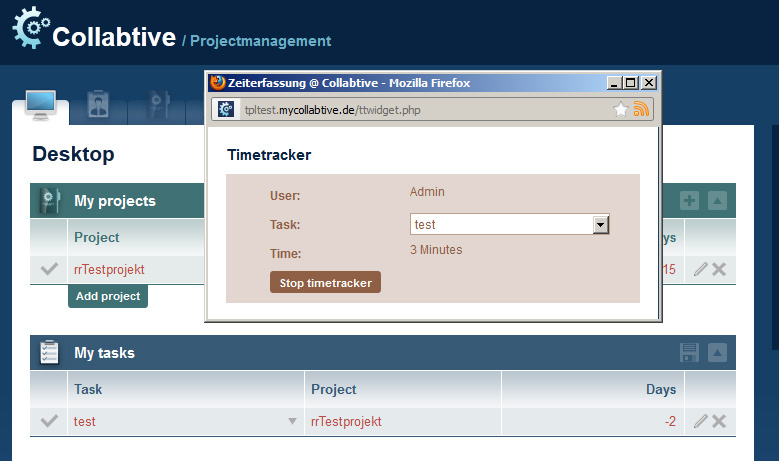 Today we have released a new plugin for Collabtive: Automatic Timetracker. Automatic Timetracker adds a timetracker widget to your Collabtive installation. The widget will open automatically when you log in to Collabtive. It allows you to select the task you are working on, click “start time tracker” when you start working and “stop timetracker” when you’re done – and have the timetracker automatically track the time you have worked. No more manual entering of start and end time. The Plugin is available for purchase on our Services page.